Modern 4-star hotel in Marina Centro, the Panama Majestic Hotel is a design structure that stands out for its contemporary style. 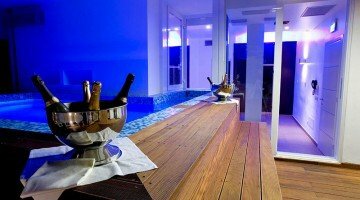 Open all year round, it has heated hydromassage pools, a wellness center with panoramic sea views and an indoor restaurant. Admits small animals. The hotel is located in Marina Centro di Rimini, near the beach and overlooking Viale Regina Elena, the main avenue of the promenade. The area is well served by public transport, the bus line n. 11, which stops a few steps from the hotel, connects the historic center of Rimini to the city of Riccione. The rooms are available in the Economy, Classic and Superior categories and are all equipped with safe, desk, LCD TV, WI-FI, minibar, bathroom with shower, hairdryer and complimentary toiletries. ECONOMY: they are the basic rooms, but still of great design and equipped with a window and all the services listed above. In the triple and quadruple solution also has a rear balcony. CLASSIC: in addition to the above services, have a balcony and slippers for free. The triple and quadruple solution has a balcony on Viale Regina Elena. CLASSIC SEA VIEW: in addition to the above services, the rooms include: balcony with panoramic view, bathrobe, sauna towel and slippers for the spa. SUPERIOR DOUBLE: guests will be honored with a welcome surprise and, in addition to the above services, the rooms include: balcony with panoramic view, bathrobe, sauna towel and slippers for the spa, morning newspaper and room service breakfast. SUPERIOR TRIPLE AND QUADRUPLE: guests will find a welcome surprise, a favorite newspaper every morning, breakfast room service, everything necessary for access to the wellness center and a bathroom with Jacuzzi. Two heated swimming pools with hydromassage, sun terrace, 24 hour reception, lift, wellness area, reading room with newspapers and local guides, congress hall, luggage room, safe, late check-out service on request and outdoor laundry. Possibility to organize events and transfer service from / to station and airport. PARKING: uncovered parking spaces available on request. CONVENTIONS: beach, amusement parks, discos, gym and swimming pool. SERVICES FOR DISABLED: the hotel is accessible and equipped for disabled people. PETS : small pets allowed, both at the hotel and at the beah affiliated with the hotel. BREAKFAST: sweet and savory buffet, with homemade desserts, croissants, fresh fruit, yogurt and savory dishes such as cold cuts, eggs and cheeses. LUNCH AND DINNER: the kitchen offers a mix of local flavors and exotic dishes, meat and fish dishes, along with buffets of appetizers, side dishes, meats and desserts. In hotel: swimming pool, pediatric consultation on request. At meals: high chairs at the tables and baby menu. 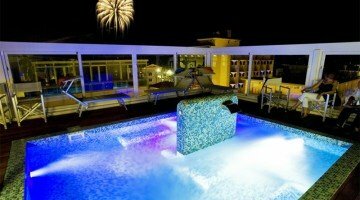 The hotel boasts two heated swimming pools with hydromassage located on the panoramic sun terrace. One of the two swimming pools is covered and usable all year. On the top floor there is an elegant wellness center with a panoramic view equipped with sauna, turkish bath and wellness paths. There are also many massages and cosmetic treatments including anti-stress, firming, decongestants, peeling and many others. In addition, a fitness center equipped with Technogym machines and a solar shower is available. There are two conference rooms for 25 and 100 seats, equipped with a flip chart, WI-FI connection and stationery. The hotel has an agreement with the beach n. 71 equipped with entertainment, fitness area, Job chair for the disabled, beach tennis courts, baby park, baby changing rooms, bocce courts, table tennis, table football and area dedicated to dogs. The list prices are from, per person per day in All Inclusive for a minimum of 7 nights in a room with at least two people. TOURIST TAX: excluded - € 2.50 per night per person, children exempt up to 13 years. - Double single use: € 20.00 per day (bookable only economy room until June 15th and from September 8th). - A deposit of 30% is required, balance at the hotel on the day of arrival. 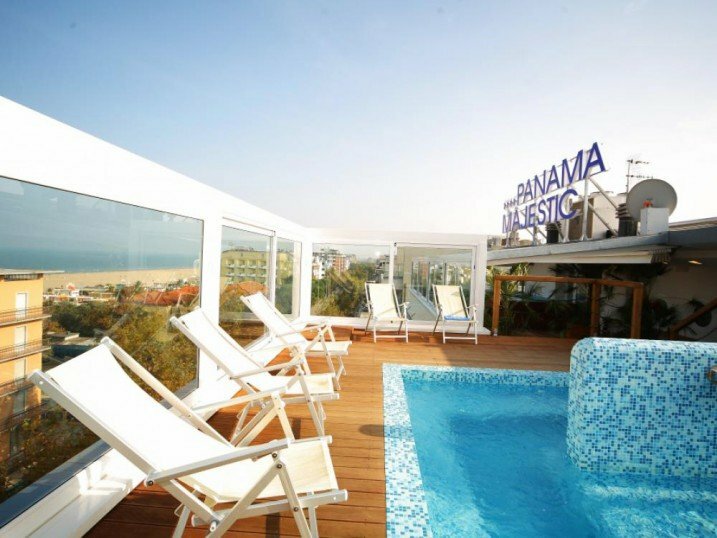 Take advantage of the Day Use offer at the Panama Majestic Hotel in Marina Centro di Rimini for a quick stopover in Rimini. THE DAY USE FORMULA is one of the latest trends in hospitality: super discounted and extremely competitive rates for a work break, with friends looking for a relaxing afternoon, for an appointment. With the comfort of a 4-star hotel and the possibility of adding even the entrance to the wellness center!